The Rolls-Royce BR700 family of turbofan engines powers regional jets and corporate jets. It was developed by BMW and Rolls-Royce plc through the joint venture BMW Rolls-Royce AeroEngines GmbH, established in 1990. The BR710 first ran in 1995. It is manufactured in Dahlewitz, Germany. Rolls-Royce took full control of the company in 2000, which is now known as Rolls-Royce Deutschland. The military designation of the series is F130. The BR710 is a twin shaft turbofan, and entered service on the Gulfstream V in 1997 and the Bombardier Global Express in 1998. This version has also been selected to power the Gulfstream G550. The BR710 comprises a 48 in (120 cm) diameter single-stage fan, driven by a two-stage LP turbine, supercharging a ten-stage HP compressor (scaled from the V2500 unit) and driven by a two-stage, air-cooled, HP turbine. In May 2017, the 3,200 engines in service reached 10 million flying hours. Another rerated version, with a revised exhaust system, was selected for the now cancelled Royal Air Force Nimrod MRA4s. The BR715 is another twin-shaft turbofan; this engine was first run in April 1997 and entered service in mid-1999. This version powers the Boeing 717. A new LP spool, comprising a 58 in (150 cm) diameter single-stage fan, with two-stage LP compressor driven by a three-stage LP turbine, is incorporated into the BR715. The HP spool is similar to that of the BR710. The BR725 is a variant of the BR710 with a three-stage-axial flow low pressure turbine to power the Gulfstream G650. Its prototype underwent component bench and its first full engine run in spring 2008. European certification was achieved in June 2009. The first Gulfstream G650, with BR725 engines, was delivered in December 2011. The engine has a maximum thrust of 75.2 kN (16,900 lbf). The 50 in (130 cm) fan with swept blades is 2 in (5.1 cm) larger than the BR710, the HP axial compressor benefits from three-dimensional aerodynamics for greater efficiency and have 10 stages including five blisks to reduce weight. The BR715 inspired combustor yields a longer life and lower emissions : 80% lower smoke and unburned hydrocarbons and 35% lower NOx than CAEP 6 limits. The two-stage HP turbine have blade active tip-clearance control for more efficiency and 3D aerodynamics reduce the cooling air flow while the LP turbine have three stages instead of two. Its cruise thrust specific fuel consumption at Mach 0.85 and FL450 is 0.657 lb/lbf/h (18.6 g/kN/s). With 24 titanium blades, the BR725 has a bypass ratio of 4.2:1 and is 4 dB quieter than the predecessor BR710. The Advance 2 development effort inserts new, advanced technology into existing 67 kN (15,000 lbf) class BR710 and the larger BR725 engines. An even larger engine will also be made, with a 52 in (130 cm) fan. The BR710 and BR715 main developments, the next generation of 44–89 kN (10,000–20,000 lbf) engines to be introduced in the 2020s, will have an Advance 3 core, improved engine health management, newer materials and cooling. They will also have a “blisk” fan made out of titanium, with an overall pressure ratio of 50:1. These improvements will yield a 10% thrust specific fuel consumption reduction, 50% NOx margin improvement, 99.995% reliability and a 20% better thrust-to-weight ratio. The Pearl engine was developed in Dahlewitz from the BR700 with Advance2 technologies. EASA certification was applied for on 28 February 2015. It made its first ground run in 2015, type tests in 2016 and flight tests in 2017. Six test engines logged over 6,000 cycles on 2,000 test hours. The test program included lightning strike, water ingestion, ice, and -40°C cold-start testing. EASA certification was granted on 28 February 2018 and it was unveiled on 28 May 2018. It was undergoing flight tests in May 2018 for an end of 2019 planned entry into service aboard the Bombardier Global Express 5500 and 6500 developments. It should have logged 10,000 hours by then. Its layout is similar to the BR.725, with the same stage count and 24 titanium fan blades. Its fan has a 48.5 in (123 cm) diameter. The enhanced 3-stage LP turbine with advanced high temperature materials, advanced segments and seals allow for higher pressures and temperatures and the new low emissions cooled combustor includes a new tiled combustion chamber. Its core uses advanced nickel alloys and ceramic coatings, includes a new 10-stage HP compressor with 6 titanium blisks and a new 2-stage HP turbine with enhanced aerodynamics and blade cooling, enhanced segments and seals. Its overall pressure ratio attains 43:1 and its bypass ratio 4.8:1. The HP compressor ratio rises to 24:1. It delivers up to 9% more thrust with 15,125 lbf (67.28 kN) and a 7% TSFC improvement while being 2 decibels quieter. Health monitoring should improve on the BR710 99.97% dispatch reliability which is logging one unplanned engine removal per 100,000 hours while the BR715 is approaching zero unplanned removals. Variant with a 65.6kN takeoff rating and a maximum diameter of 1820mm. Variant with a 65.6 kN (14,700 lbf) takeoff rating and a maximum diameter of 1820mm. Variant with a 69 kN (16,000 lbf) takeoff rating for the BAE Systems Nimrod MRA4. Variant with a 68.4kN takeoff rating and a maximum diameter of 1785mm. Variant with an 83.23kN (18,500 lbf) takeoff rating for Boeing 717-200 basic gross weight variants. Variant with an 89.68kN (20,000 lbf) takeoff rating. Variant with a 95.33kN (21,000) takeoff rating for Boeing 717-200 high gross weight variants. Variant with a 71.6 kN (16,100 lbf) takeoff rating. The BR715 thrust ratings can be adjusted by changing a plug in the FADEC controller, meaning no engine change is required. The A1-30 can become a C1-30 with a simple plug and software change. ^ a b c "Rolls-Royce achieves 10 million flying hours on its BR710 engine" (Press release). Rolls-Royce. 22 May 2017. ^ "Gulfstream G650 - Rolls-Royce power". FlightGlobal. 13 March 2008. ^ "Rolls-Royce completes successful first run of BR725 engine". FlightGlobal. 30 Apr 2008. ^ "Rolls-Royce wins certification for BR725 engine". FlightGlobal. 25 Jun 2009. ^ "Gulfstream completes first G650 delivery, gains production authority". FlightGlobal. 28 Dec 2012. ^ a b c "Type Certificate Data Sheet E.018" (PDF). EASA. 28 February 2018. ^ a b c Thierry Dubois (April 28, 2010). "Engine makers consider clean-sheet designs". Aviation International News. ^ "Rolls Royce offers BR725 for B-52 re-engine effort". FlightGlobal. 14 September 2017. Retrieved 17 September 2017. ^ "Rolls-Royce Bullish On Prospects For Bizjet Sector". Aviation International News. April 11, 2017. ^ a b c "Rolls-Royce celebrates launch of new Pearl engine family" (Press release). Rolls-Royce. 28 May 2018. ^ a b c d e f "Pearl 15". Rolls-Royce. ^ a b c Stephen Trimble (28 May 2018). "Rolls-Royce reveals surprise Pearl engine family for business jets". Flightglobal. ^ a b Kerry Lynch (May 28, 2018). "Rolls-Royce Pearl 15 Marks Launch of New Engine Family". AIN online. ^ a b c John Morris (May 28, 2018). "Rolls-Royce Barrels Back Into Bizjets With Pearl Engine". Aviation Week Network. ^ a b c d "Type Certificate Data Sheet E.018 - BR700-710 series engines" (PDF). European Aviation Safety Agency. 23 June 2009. Archived from the original (PDF) on 23 December 2009. Retrieved 3 January 2010. ^ "BR710". Rolls-Royce Germany. Retrieved 3 January 2010. ^ a b c "Type Certificate Data Sheet E.023 - BR700-715 series engines" (PDF). European Aviation Safety Agency. 27 July 2009. Archived from the original (PDF) on 23 December 2009. Retrieved 3 January 2010. ^ "Type Certificate Data Sheet E.023" (PDF). EASA. 27 July 2009. ^ John Croft (29 Sep 2008). "G650: As good as it gets?". Flightglobal. 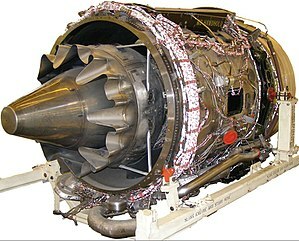 Wikimedia Commons has media related to Rolls-Royce BR700 family. Guy Norris (2 June 1999). "European powerhouse". Flight International. This page was last edited on 8 December 2018, at 11:23 (UTC).